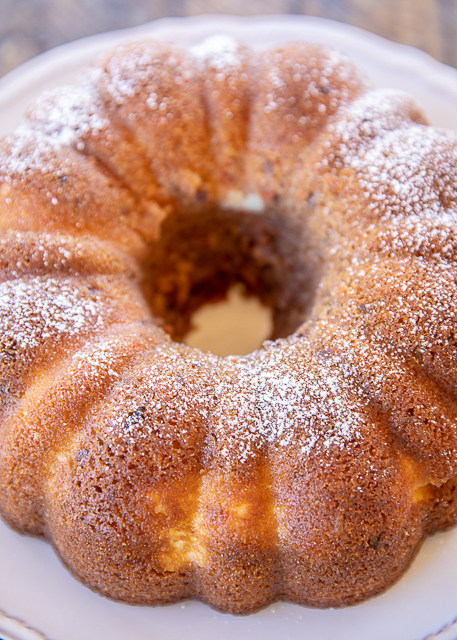 Cream Cheese Carrot Bundt Cake - only a few simple ingredients make this delicious cake. Cake with a can of frosting in the batter. Carrot cake mix, water, oil, eggs, a can of coconut pecan frosting, cream cheese and sugar. I couldn't believe how delicious this cake tasted. Can make a few days in advance and store in an air-tight container. Great for holidays and potlucks! Carrot Cake is a must for Easter! 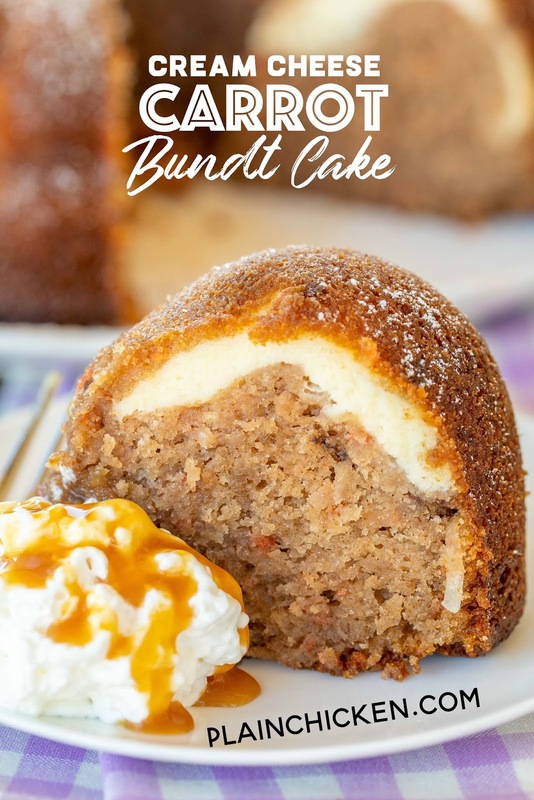 I am not a huge carrot cake fan, but I can not resist this Cream Cheese Carrot Bundt Cake. It is crazy good!!! 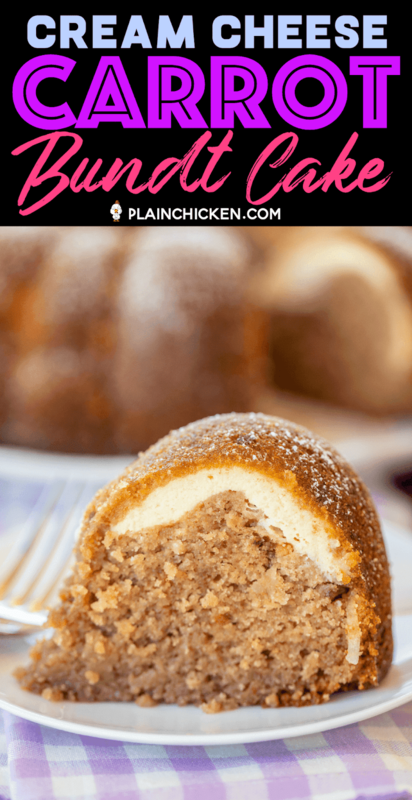 The cake is super moist, and I can’t get enough of that cream cheese filling! 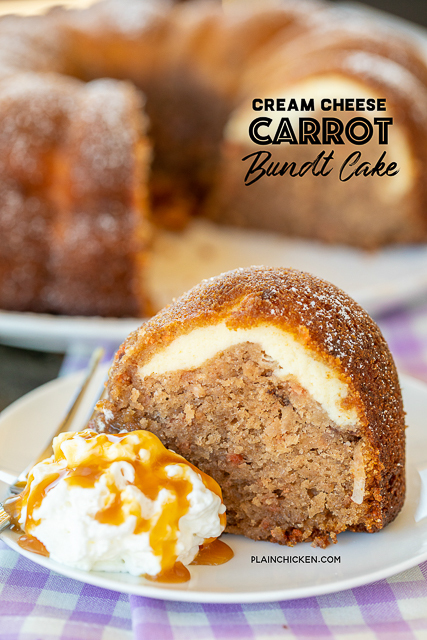 This Cream Cheese Carrot Bundt Cake is super easy to make. It starts with a box of cake mix and a can of frosting. You are going to combine the two with some eggs, water, and oil. DO NOT make the cake mix as directed on the box. Use the cake mix straight out of the box. 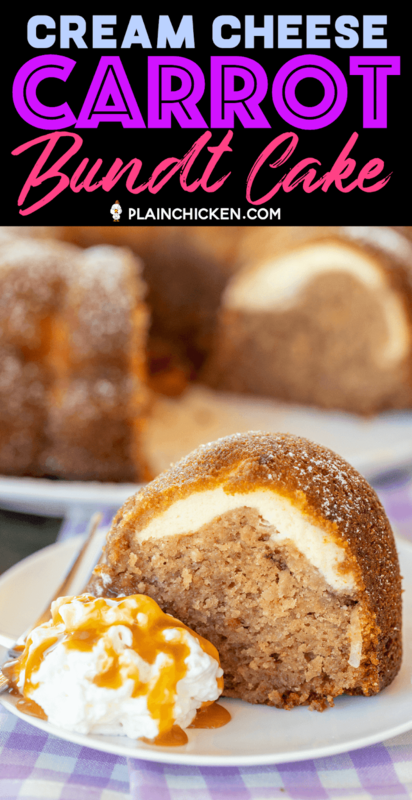 What really puts this Cream Cheese Carrot Bundt Cake over the top is the yummy cream cheese filling. It is basically a layer of cheesecake in the middle of the cake. My filling sank to the top of the cake, but it still tasted great!!! Next time I might add some drained crushed pineapple to the cake batter. Sounds amazing!! 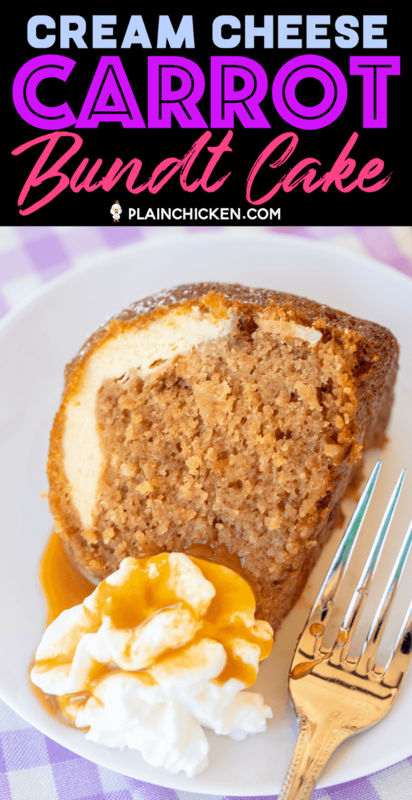 We sprinkled this Cream Cheese Carrot Bundt Cake with some powdered sugar and served it with a dollop of whipped cream and a drizzle of caramel sauce. It would also be great with a big ol’ scoop of vanilla ice cream or a simple glaze! 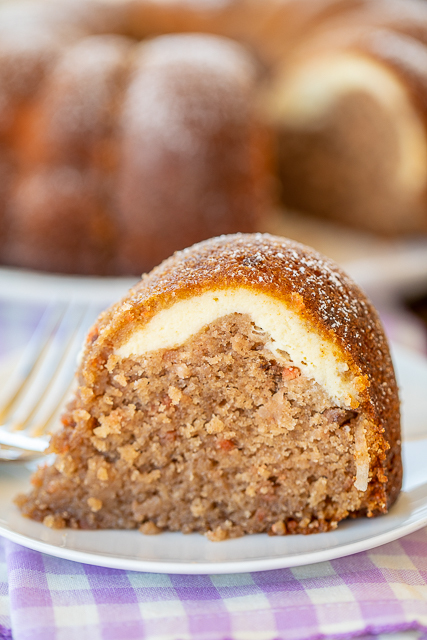 You can make this cake a day in advance and store it in an air-tight container. It is the perfect dessert for your Easter meal! Preheat oven to 350ºF. 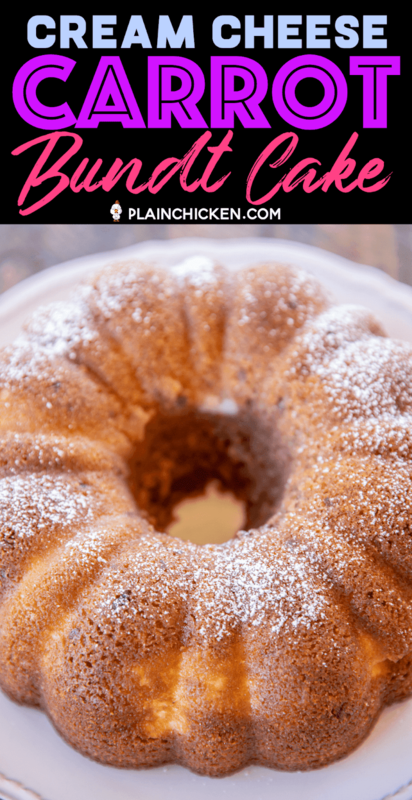 Grease a BUNDT PAN with cooking spray and set aside. Combine cake mix, water, oil, eggs, and frosting in a large mixing bowl. Beat with a HANDHELD MIXER until smooth. For the cream cheese filling, beat cream cheese with sugar, vanilla, and egg with a HANDHELD MIXER until smooth. Set aside. Pour 3/4 of batter into prepared pan. Spoon cream cheese mixture into pan. Top with remaining cake batter. Bake for 60 minutes, until cake tests done. Allow cake to cool in pan for 10 minutes. Invert pan onto a wire rack and cool completely. that german chocolate frosting is my favorite EVER!!!! and carrot cake -oye vay! yum! I don’t own a hand mixer. Any reason I can’t just use my stand mixer on low speed? A stand mixer will be just fine. Enjoy! I couldn't find coconut pecan frosting at Publix, Winn-Dixie or Fresh 4 Less. I usually can find everything at Publix! Do you have a second favorite I might try? Pretty sure German Chocolate and Coconut Pecan are the same thing.